Lint Filter Retainer for Smarltoad Dryers. Item #14 as shown in diagram. 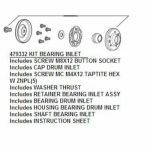 395191 Fisher Paykel Dryer Thermostat Manual Reset. Genuine Fisher Paykel factory replacement part. Fits Fisher Paykel models: DG27CW1, DG62T27CW1, DG62T27CW2, DG62T27DW1, DG62T27DW2, DG62T27GW1, DG62T27GW2, DGGX1, DGGX2, DGGX2, DGIX2. Replacement lint screen for Smartload Dryers. 395188P Silicon Carbide ignitor for Smartload Gas dryers. Idler/tensioner pulley kit for top load dryers. Includes all parts shown. Complete Motor assembly. Includes 395034 Blower Assembly and Wire Harness. Replacement lint bucket for Smartload dryers. 395560P Drum Bearing Assembly for Smartload Dryers. Item #8 as shown in diagram. This part fits on the lint filter side of the drum. This is not the bearing on the RIGHT side! Lid assembly for Smartload Dryers.